Starting at the back of the grid is hardly the way Jolyon Palmer would have chosen to start his last grand prix for Renault - what could well be his last grand prix ever - but an engine penalty means that’s his lot. Although it was a difficult weekend for the team, the car lacking downforce and slower than the McLarens despite Suzuka being a power circuit, Palmer’s qualifying performance was one of his better ones - his margin of 0.264secs was only the fifth time all season he has been closer to Nico Hulkenberg than half a second, and way better than his average deficit of more than 0.6secs. It was announced on Saturday evening in Japan that Palmer and Renault had reached agreement for him to leave the team after this race, to be replaced by Carlos Sainz - after weeks of Renault trying to make that deal work. Palmer has fallen short in F1, but he has tried hard, and it would be churlish to hope for anything other than for him to have a good race with which to sign off from F1, whether it be for now or forever. Britain's Jolyon Palmer, who starts 18th, in his last race for Renault: "I am starting near the back after the penalty and it is a nothing to lose race. "I am out to have fun, try to move forward and enjoy the race. "I appreciate the support. It is my last race for Renault not my last in Formula1. I have to see what the future holds. I have been at the team for a few years and want to go out on a high." Speaking of Jolyon Palmer, this is sadly his last race as a Renault driver. The Briton, who has had a difficult season alongside Nico Hulkenberg, will be replaced by Spaniard Carlos Sainz, who has already been signed for 2018. Sainz's place at Toro Rosso will be taken by Russian Daniil Kvyat. Here's a reminder of the grid. Fernando Alonso starts at the back of the grid after picking up a 35-place grid penalty. Valtteri Bottas, Kimi Raikkonen, Carlos Sainz and Jolyon Palmer have also picked up grid penalties and dropped down the grid from where they qualified. Darren Wilmshurt: Just at San Francisco airport waiting for flight home. Hope to catch the start before flight takes off. Lewis Hamilton, speaking during the drivers' parade: "We love it here. We always have great support every year. I seem to have a growing following and I appreciate that. We are slowly trying to convert everyone from Ferrari to Mercedes fans." Anyone out there!? If you are, feel free to send in your thoughts on anything and everything to do with today's race, the title battle or simply what the best car hat is you've seen in Japan. Get involved #bbcf1, text in on 81111 (UK only) or post a comment on the BBC Sport Facebook page. The drivers' parade is well under way as the class of 2017 gets driven around the track in an array of classic cars. Lights out in one hour. You can listen to live race commentary on BBC Radio 5 live and online from 06:00 BST while build up will be on air from 05:30. We've had all the weather so far in Suzuka but it's bright and sunny for race day. It's 25C at the moment and the chance of rain during the race is very low - just 10%. There's encouragement for Sebastian Vettel in that only three of the previous seven Japanese GPs have been won from pole position. Pole number 71 was special for Lewis Hamilton, not least because it is the first time he has ever qualified fastest at Suzuka, a remarkable statistic for the fastest driver of his generation on the most challenging drivers’ circuit. Hamilton said this was the first time he had ever felt the car really beneath him at this track. Welcome along to our coverage of the Japanese Grand Prix. Andrew Benson has set the scene perfectly for what promises to be a thrilling race. Lewis Hamilton and Sebastian Vettel start alongside each other on the front row for the first time since the Belgian Grand Prix in August and both drivers have vowed to be aggressive if need be. But push too hard on this track and you can be badly punished. Hamilton has won this race as a Mercedes driver twice before - in 2014 and 2015 - and on both occasions he went on to win the world championship. Another victory today will surely put him on the path to a fourth title. This race could hardly be set up better. The two title protagonists on the front row. A decent advantage for Mercedes in qualifying, but not so big that you don’t imagine the Ferrari will be able to challenge it in race trim. Probably the greatest race track in the world, and a difficult decision on strategy. 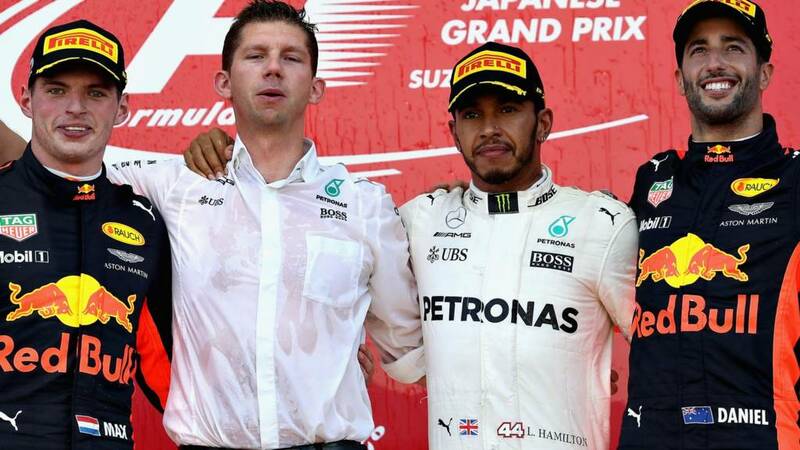 If Lewis Hamilton wins at Suzuka, his points advantage will be out to at least 41 with only 100 remaining and he will have the title in a headlock. Vettel needs to win - but can’t afford any mistakes. When a driver wins the Japanese Grand Prix, they more often than not go on to win the title. Lewis Hamilton, the championship leader, starts today's race on pole. Alongside him on the front row is his title rival Sebastian Vettel. The stage is set for potentially the key race of the season.